So you’re running Sage 100 ERP and one of your customers requests that you start using EDI software to receive orders. What is EDI, and how can you implement it? 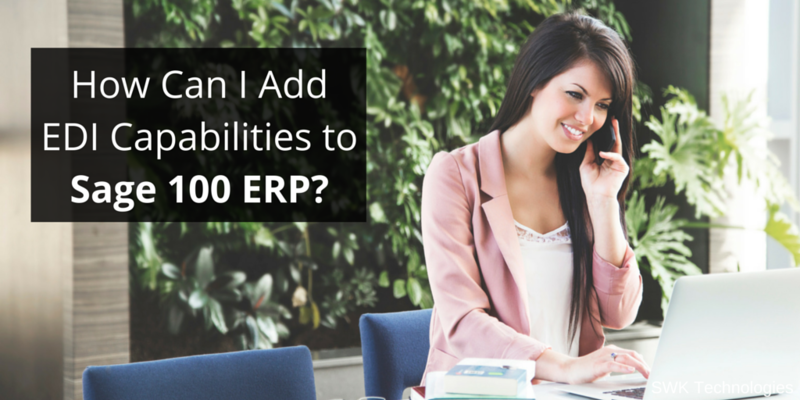 This article explains EDI and shows just how easy it is to use with your Sage 100 ERP system. First Off, What Is EDI? EDI, which stands for Electronic Data Interchange, is a data-transfer system that retailers and their suppliers use to automatically co-ordinate shipments, product data, inventory information, and more. An EDI system translates the information in your Sage 100 ERP system into a raw data file that can be read by your trading partner’s computer system. This helps your product get quickly and efficiently processed into your retailer’s inventory. How Do I Get EDI? To start using EDI at your company, you’ll have to implement an EDI system. First, you’ll have to choose whether you want to use a cloud-based EDI system, or an in-house EDI system that is installed on your office computers. Cloud EDI typically relieves the internal burden of managing EDI-related tasks and outsources it to subject matter experts, whereas an in-house system relies heavily on having internal EDI staff to manage and maintain the environment. Whether you choose cloud or in-house EDI, it’s a straightforward process to set up. A dedicated consultant / implementation specialist will get the program set up for you, will work with you to train your staff on your new EDI system, and will create any specialized trading documents (also known as “maps”) that you need for your specific retailers. To use EDI, you need to transmit shipping papers, product descriptions, identification, and more. Each of your trading partners is going to require slightly different information from you, or they will all require the same information in a slightly different order. EDI “maps” compile the necessary data into the right order automatically, making it easy for you to transmit the information your trading partners need, in the format that they want it, directly from your Sage 100 ERP system. Like your own company, your trading partners like to receive information in the way that works best for their needs. Sending the right information in the right order helps you avoid costly chargeback fees. While you have many options for EDI, if you’re running Sage 100 ERP, Sage 500 ERP, or Sage ERP X3, I recommend MAPADOC. Because it’s the only EDI solution that looks and feels like your Sage ERP system, companies who choose to work with MAPADOC experience a faster learning curve and the software seems more intuitive instantly. Plus, MAPADOC offers unlimited training and support, so that you can save costs and maintain complete control of your EDI system, while knowing that you have a helping hand when you need one. With over 20 years in the Sage marketplace and 700+ implementations, MAPADOC’s expert team includes a dedicated consultant who will work with you to not only get your EDI software up and running, but will also increase your EDI confidence.